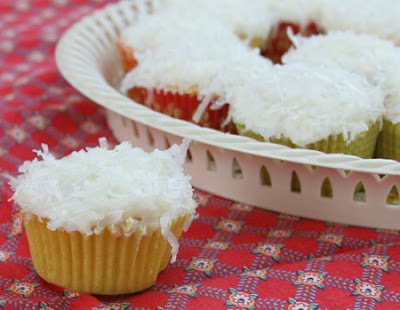 cardigans and kids: Coconut Cupcakes (with cream cheese & vanilla bean frosting). Coconut Cupcakes (with cream cheese & vanilla bean frosting). We were invited to share lunch with some dear friends today and I being the lover of dessert that I am, I offered to bring dessert. So, monster cookies were made, but I thought we needed a bit more variety, so out came the recipe books and loose leaf papers of all the recipes that are on my "to try" list. The coconut cupcakes from Martha Stewart won and were baked and frosted with the help of Matheau. The cupcakes are moist, delicious, and pretty quick to mix together. I will be making these again. -3/4 cup (1 1/2 sticks) unsalted butter, room temp. -2 large whole eggs plus 2 egg whites, room temp. -1 1/3 cups unsweetened coconut for garnish after frosting. (I used sweetened and it still tastes great! 1. Preheat oven to 350 F. Line the standard muffin tins with paper liners. Whisk the flour, baking powder and salt together. Pulse the shredded coconut in a food processor until finely ground, and whisk into the flour mixture. 2. With mixer on medium-high speed, cream butter and sugar until pale and fluffy. Gradually beat in whole eggs, whites and vanilla, scraping down the sides of bowl as needed. Reduce speed to low. Add flour mixture in three batches, alternating with two additions of coconut milk, and beating until combined after each. 3. Divide batter evenly among lined cups, filling each 3/4's full. Bake, rotating halfway through, about 20 minutes. Or until the toothpick comes out clean. Remove from oven, turn cupcakes until wire racks to cool completely. Frost generously. -1/2 cup (1 stick) of unsalted butter, room temp. In your stand up mixer, cream the butter and cream cheese. Add the vanilla bean and coconut milk. Slowly add the powdered sugar until you've reached your desired consistency. Refrigerate for 10 minutes. Pour the 1 1/3 cups of coconut into a bowl. 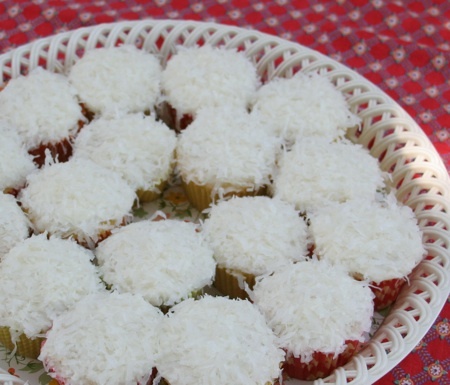 Frost and dip the tops in the coconut. *Unfrosted cupcakes can be stored overnight at room temp. or frozen for up to 2 months. Refrigerate if frosting them. Store in an airtight container.